The sugarcane aphid, Melanaphis sacchari (Figure 1), was first reported damaging grain sorghum in Louisiana and Texas in 2013. Previously, it had only been known as a pest of sugarcane. This aphid pest has been spreading across the southern U.S. since then and now is found in sorghum in North Carolina and as far north as the Wichita, Kansas area this summer. It can also feed on other sorghum species such as forage sorghum, shattercane, and Johnsongrass. It has not been reported in Nebraska. Nebraska grain sorghum producers should check their fields for the potential presence of this insect. Aphid colonies are initially most common on the undersides of lower leaves but can be found higher in the canopy as populations increase. The presence of dark sooty mold on the sugary "honeydew" secretions of aphids also can indicate their presence. The sugarcane aphid is light yellow to gray, with dark cornicles ("tail-pipes") at the end of the body and dark tarsi (feet). Adult aphids can be winged or wingless. The other two common sorghum aphids in Nebraska — the greenbug and corn leaf aphid — have significantly different coloration and markings. (See Figure 2.) Another common aphid on weedy and wild grasses that looks similar is the yellow sugarcane aphid (Figure 2). This aphid is not a common pest of sorghum in Nebraska, but can reach economic numbers in southern states. It can occasionally be found in large colonies on foxtail grasses (e.g., common foxtail). 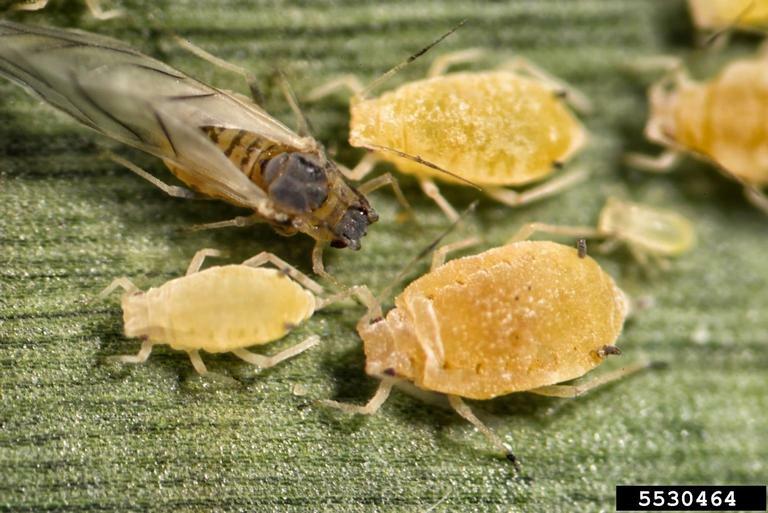 High populations of sugarcane aphids on sorghum can be a concern because of direct yield loss, as well as the effects of their sugary secretion, honeydew, which has been reported to interfere with harvest in heavily infested fields. Additionally, these aphids can also transmit millet red leaf, sugarcane yellow leaf, and sugarcane mosaic viruses; none of which pose a threat to sorghum in Nebraska. Threshold recommendations vary somewhat by state. Texas Agricultural Extension Service recommends treatment if the field-average infestation is 50-125 sugarcane aphids per leaf. Oklahoma State University Cooperative Extension Service recommends treatment if 30%-40% of plants are infested (have at least one colony of sugarcane aphids). 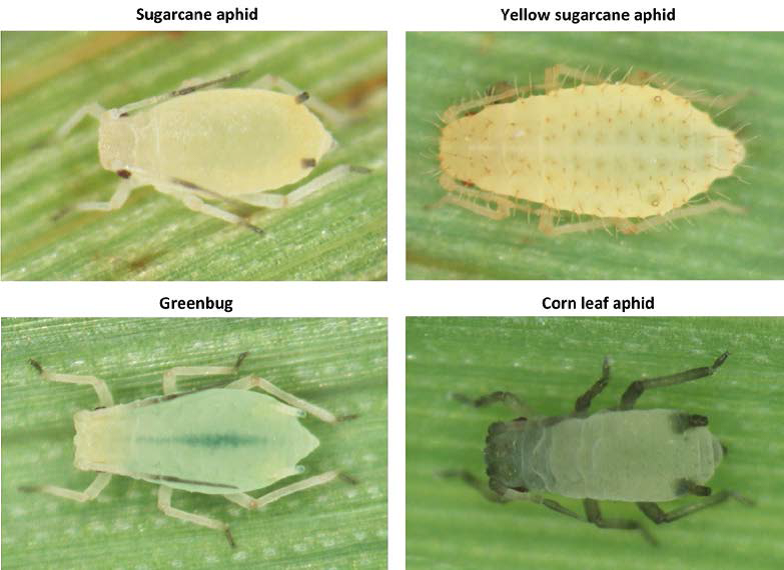 Reports from southern states indicate that the sugarcane aphid is relatively difficult to control with standard aphid insecticides. Products containing chlorpyrifos (Lorsban Advanced, NuFos, etc.) are reported to provide moderate to good control when applied at 2 pints per acre, with 1 pint per acre providing suppression. A concern is that the 2 pint per acre rate has a preharvest interval of 60 days for grain, so this may not be a good choice for later season applications. The 1 pint per acre rate has a 30-day preharvest interval for grain. Other states have recommended not to use pyrethroid insecticides against the sugarcane aphid. They are not highly effective and may lead to aphid resurgence due to their negative effect on aphid natural enemies (lady beetles, minute pirate bugs, wasp parasitoids, etc.). A new product from Bayer CropScience, Sivanto 200 SL (active ingredient flupyradifurone), now has a federal label for aphid control on grain sorghum, and is effective against sugarcane aphids. Sivanto 200 SL is labeled at 7-10.5 fl oz per acre for sugarcane aphid control. It is more selective and is less likely to reduce natural enemy populations than organophosphate or pyrethroid insecticides. The preharvest interval for Sivanto 200 SL is 21 days for grain and 7 days for forage. Regardless of the product used, good spray coverage is important. Control may be improved by using 5 or more gallons/acre by air, or 10 or more gallons per acre by ground, since the aphids feed on the undersides of the leaves. If you find aphids on sorghum that you suspect may be sugarcane aphids, please submit a sample to the UNL Plant and Pest Diagnostic Clinic so we can document the presence of this aphid in Nebraska.